If you are obsessed with The Hunger Games franchise like myself, you’ll be ecstatic to hear that MTV has provided us with more questions and answers from our favorite stars. We asked the questions – and Josh Hutcherson, Jennifer Lawrence, and Liam Hemsworth answered them as promised. On Wednesday MTV showed pictures from the Q&A, and now we can find out what they had to say. The questions were posed via twitter (good lord how I love that social media tool), with all 3 actors opening up honestly on their thoughts and experiences while filming the highly anticipated film. After one fan asked which actor is most like their character, both Jennifer and Josh immediately agreed that it is Josh is who exactly like his character Peeta. At least you get fit girl! 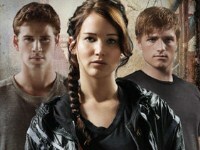 The Hunger Games hits theaters March 23rd!! !